Musical Theatre of Anthem Presents Seussical Jr.
Anthem, Ariz. March 8, 2017 � Musical Theatre of Anthem (MTA) announces their upcoming production of Seussical Jr., a fantastical musical extravaganza from Tony winners Lynn Ahrens and Stephen Flaherty featuring Horton the Elephant, the Cat in the Hat, and all your favorite Dr. Seuss characters together onstage May 11-14, 2017. 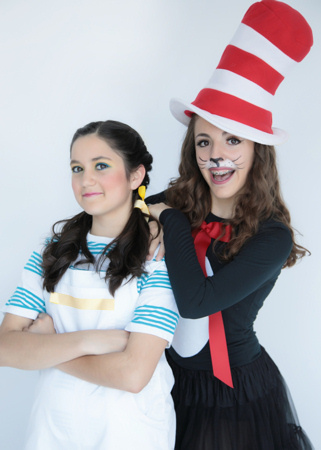 "Oh, the thinks you can think" when Dr. Seuss' best-loved characters collide and cavort in an unforgettable musical caper that transports audiences from the Jungle of Nool to the Circus McGurkus. The Cat in the Hat narrates the story of Horton the Elephant who discovers a speck of dust containing tiny people called the Whos. Horton must he protect the Whos from a world of naysayers and dangers, and he must also guard an abandoned egg that's been left in his care by the irresponsible Mayzie La Bird. Although Horton faces ridicule, danger and a trial, the intrepid Gertrude McFuzz never loses faith in him. Ultimately, the powers of friendship, loyalty, family, and community are challenged and emerge triumphant! The talented cast, comprised of award winners and nominees ages 12-18, presents the show May 11-14, 2017 in Anthem. The award-winning production staff includes Director/Choreographer Sarah Brayer and Vocal Director Shawna Weitkamp. Performances take place Thursday � Sunday at Musical Theatre of Anthem, 42323 N. Vision Way, Anthem, AZ 85086. Times vary, see website for details. Tickets may be purchased online at www.musicaltheatreofanthem.org. Adult tickets are $19; Students, Seniors and Children 12 and under are $16.